Universal Meningitis B vaccine nears approval by European regulators – thank the mice (and the scientists)! Bacterial meningitis is an infection of the fluid that is found in the spinal cord and surrounding the brain that affects thousands of people – usually children or young people – every year and can result in brain damage, hearing loss, or learning disability. In about 10% of cases the infection is fatal. One of the most common causes of bacterial meningitis is infection by Neisseria meningitides, and while vaccines have been developed against some serotypes of N. meningitides, but so far no vaccine has been produced that can provide broad protection against N. meningitides serotype B (Meningitis B), which is responsible for most cases of bacterial meningitis in Europe. A major problem has been that there are many different strains of Meningitis B, and until now vaccines made against it have only protected against single specific strains, so that their usefulness has been very limited. Last weekend we learned that a new “Universal” vaccine that protects against a broad range of Meningitis B strains the has been given a ‘positive opinion’ by the European Medical Agency’s Committee for Medical Products and is now expected to be granted a license within 2-3 months. The Bexsero vaccine – called 4CMenB during its development – was developed by Novartis and has been hailed as the “biggest leap forward in the field” in 30 years by the charity Meningitis UK, and if added to the vaccination schedule will for first time enable babies and young people to be vaccinated so that they are protected against Meningitis B strains for many years to come. Studies in mice played a crucial role in the development of the new Meningitis B vaccine. Image courtesy of Understanding Animal Research. At this point some of our readers may be wondering why this all sounds a little familiar. Never fear, there is a good reason for this. Bexsero was made by adding to an experimental recombinant antigen vaccine named rMenB – a vaccine that had already provided a high degree of protection against a wide range of Meningitis B strains in earlier trials – the outer membrane protein that had been used in a vaccine against a specific strain of Meningitis B that was responsible for an outbreak in New Zealand. The resulting multicomponent vaccine provided an even higher degree of protection against multiple Meningitis B strains, particularly in infants, making it more suitable for use in large-scale preventative vaccination programs (1). The development of the new vaccine is also noteworthy because of how it was done. Vaccine development relies on identifying parts of the bacterium known as antigens that can act as targets for the immune system. Rather than using the usual method of attempting to isolate bacterial protein that might act as antigens the Novartis team led by Dr. Mariagrazia Pizza adopted a “reverse vaccinology” approach where they searched the Neisseria meningitidis genome for genes that encoded proteins that might be useful antigens. They identified over 300 potential antigens, and the next step was to screen these for their ability to stimulate the immune system to produce antibodies that kill bacteria in vitro. 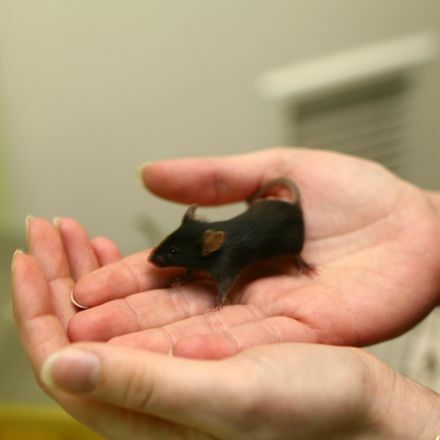 This required an intact functioning mammalian immune system, so the researchers used mice. It is worth noting that the successful meningitis vaccines already in use in the UK include the Hib polysaccharide-protein conjugate vaccine, which has almost eliminated meningitis due to infection with the Haemophilus influenzae type B bacteria, once the major cause of meningitis in babies and young children. Needless to say animal research played a crucial role in the development of this vaccine against Haemophilus influenzae type B (2,3). Soon Bexsero may have an equally dramatic impact on Meningitis B, and mark another success against this devastating illness. Posted on November 22, 2012 November 22, 2012 by EditorPosted in News, Science NewsTagged animal research, Bacterial meningitis, meningitis B, mouse, vaccine.